Buffalo News cartoonist Adam Zyglis won the Pulitzer Prize on Monday. 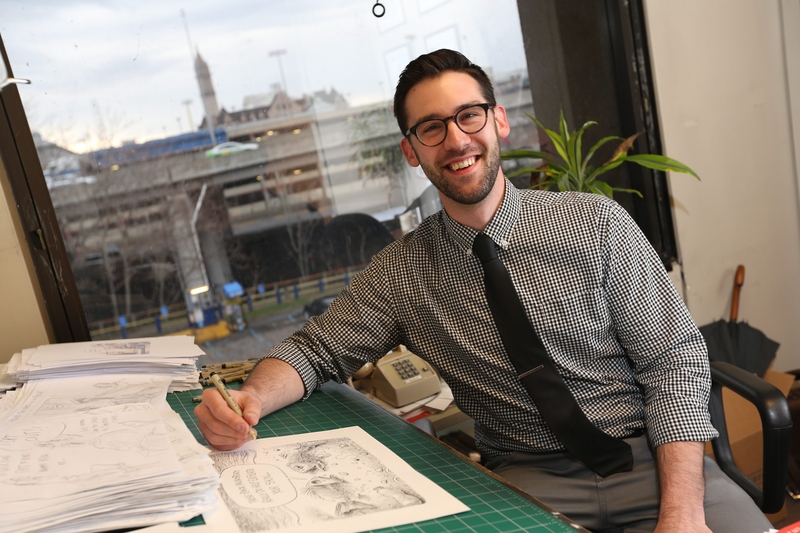 Almost 11 years ago, The Buffalo News hired Adam Zyglis straight out of college to replace the great Tom Toles, The News’ longtime editorial cartoonist. Toles had won a Pulitzer Prize and was leaving to succeed Herblock at the Washington Post. This week, Zyglis reached journalism’s pinnacle. He was awarded the 2015 Pulitzer Prize for editorial cartooning. Remarkably, Zyglis is the third News cartoonist to be awarded a Pulitzer Prize. Bruce Shanks received a Pulitzer in 1958 and Toles in 1990. The News’ other Pulitzer: In 1961, Buffalo Evening News reporter Edgar May was awarded the prize for local reporting “for his series of articles on New York State’s public welfare services,” according to the Pulitzer website. To view all of Zyglis’ cartoons, going back to his eight-grade contest winner, go to buffalonews.com/zyglis. The News was also a Pulitzer finalist last week for our coverage of the November 2014 “Wall of Snow” storm. Over six days, The News staff tweeted, posted to Facebook, posted to the Web and filed to the newspaper more than a thousand written news items. Nearly 800 photos were posted. The newspaper had 62 pages of coverage. Even in Buffalo, where big snow is part of life, the storm was a monster. It was a freak lake-effect storm that dumped 7 feet of snow on the southern part of the city and nearby suburbs but left downtown and the northern suburbs almost untouched. Thirteen people died in the storm. Hundreds were trapped in trucks and cars on the New York State Thruway and on local streets. It caused an estimated $49 million in damage. We rated it the second-worst storm in Western New York’s recorded history. The News staff knocked itself out to cover the storm. It is nice to get national recognition. The storm also taught us an important lesson: We are investing in snow shoes for reporters and photographers. Mike Connelly – Mike Connelly is editor of The Buffalo News.